As a medium-sized family-owned group of companies, BERGER covers the complete spectrum of building services: from individual building services to complex large-scale projects, from raw material extraction and processing to the development, manufacture and supply of modern building materials. 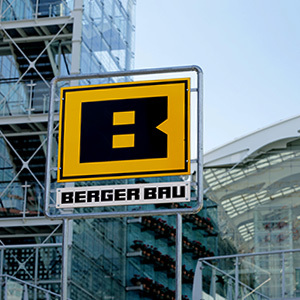 BERGER BAU SE is the driving force of the BERGER GROUP in Germany, with its headquarters in Passau and the subsidiary in Berlin with building yards, workshops, asphalt mixing plants and a prefabricating plant as well as its own logistics. BERGER BETON puts its whole professional passion into developing construction material solutions that offer you exceptional benefits and open up new competitive advantages. Our activities are guided by the company maxim of consistently aiming for optimum customer benefits. This includes not only construction site logistics which ensure on-schedule and time-saving delivery, but perfectly maintained machines and equipment for commercial use in our own workshops plus our solution-driven and specialist construction site personnel and state-of-the art laboratories.